Got questions about the League of Maidens® game? Check out these frequently asked questions. If you can’t find an answer here feel free to contact us! WHAT IS LEAGUE OF MAIDENS®? WHY MAKE LEAGUE OF MAIDENS®? We’re both tired of watching epic cinematic game trailers only to find the game pales in comparison to the trailer. League of Maidens plays like an epic CGI video game trailer and its pure unadulterated awesomeness. When the game is feature complete and released League of Maidens® will be a free-to-play game. Players will be able to download and enjoy the game without paying a single dollar. As a free-to-play game we do make certain cosmetic items available for purchase using MC (Maiden Crystals purchased with real dollars). IS THIS JUST ANOTHER PAY2WIN GAME? At Maiden Gaming we pride ourselves in making truly Free-to-Play games that will never charge for anything required to be competitive in the game. Any items available for purchase are purely for cosmetic purposes like outfits, war maiden skins, asset skins etc. Nothing that you can purchase will enhance your character or give you an advantage over a player that hasn’t spent any money on the game. HOW LONG DOES AN AVERAGE GAME LAST? An average match of League of Maidens® lasts about 20 minutes, though some matches can be longer or shorter in length. IS THE TRAILER CGI? OR IS THAT IN-GAME FOOTAGE? The trailer consists of 100% in-game footage. Everything that you’ve seen in the trailer including flying at the speed of sound, hero landings, crashing through buildings, transforming, throwing fire balls are all in-game. The trailer itself was created using a tool called Motion Replay™ that will be made available to players so that they can use the same tool that we used in-house to create your own awesome League of Maidens® trailers and videos. HOW MANY CHARACTERS ARE AVAILABLE FOR PLAYING? Our approach to characters and abilities/skills is very different then the norm. The focus isn’t on pre-made heroes that lock in abilities or skills. There are literally unlimited variations of war maidens that can be created by players through our character customization system which also includes configurable abilities, skills and perks. Want to create a tanky war maiden that can take and deal lots of damage? Simply equip the perks to increase your defense and attack characteristics. But know that perks equipped will be balanced by increasing some characteristics and decreasing others. This system along with offering tons of options to configure your war maiden’s look will allow players to completely customize characters to their liking. WHAT MAKES LEAGUE OF MAIDENS® UNIQUE? League of Maidens® takes several different and innovative approaches to traditional tower defense games. Amazing and action-packed flight controls, day and night cycles, true 3d and massive open area battlefield, interior and exterior battle areas and the ability to battle on land, sea and air are just a few things that help to make League of Maidens® stand out from our competition. Here is a list of features that will find in League of Maidens®. Two different character versions that can be customized and swapped during live gameplay. Building and recruiting military assets (soldiers, tanks, turrets, war ships and jets) and much more. DO I NEED AN ACCOUNT TO PLAY LEAGUE OF MAIDENS®? Yes. An account at maidengaming.net is required to play the game. Having an account will also allow players to interact with our community. Viewing forum posts along with promotional video and photos does not require an account. DO I NEED TO BE ONLINE TO PLAY LEAGUE OF MAIDENS™? Yes online connectivity is required. Maiden Gaming™ is a company that creates free-to-play online games. All of our offerings will require that players have online connectivity during gameplay. 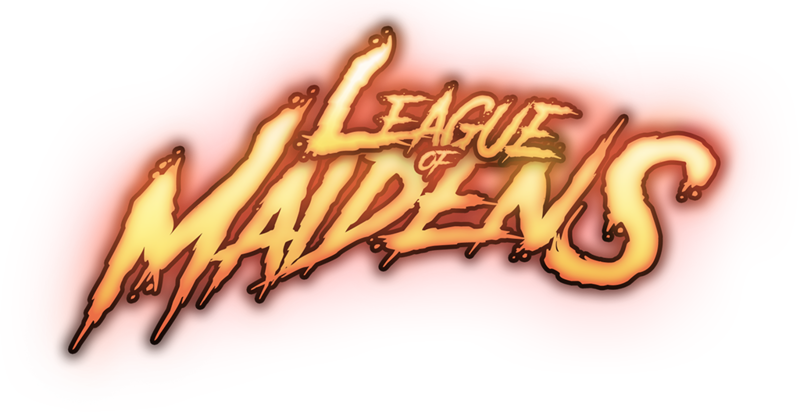 Upon launch League of Maidens® will be available on PC. Other platforms maybe considered for the future but at this time PC builds are our priority. WHAT ARE THE SYSTEM REQUIREMENTS TO PLAY @ 1080p? Use this link to compare your graphics card against the minimum requirements. Compare your gpu. We are currently in phase 1 of our private alpha. Pledge packages to participate in the private alpha are currently sold out. We are hoping to move to phase 2 soon which will complete delivery of keys to everyone that purchased packages. After phase 2 we will make keys open to the public. We are working as quickly as possible to get to that point.Want to request access to the alpha when it is available to the public? Click here to register and request alpha access!!! WILL YOU ADD AN ONLINE MULTIPLAYER FEATURE? Yes! Our goal for the alpha build is to polish the A.I. making the PvE gameplay as competitive as possible. Our next goal for the beta build is to round out the available skills offering players a wide range of choices when configuring their war maidens, adding more content like race skins, outfits, hairstyles and lastly adding PvP mode for online multiplayer. WHAT STAGE IS THE GAME IN? ALPHA, BETA OR FULL RELEASE? League of Maidens® is currently in what we would classify as alpha stage. We consider the definition of beta to be software that is feature complete. Because additional features like PvP have not yet been added we cannot consider the game to be a beta. Once PvP is added we will consider the game to be in beta. League of Maidens® has been in ongoing development for a little over two years.